Osteoporotic Compression Fractures - Matthew D. Hepler, M.D. Osteoporotic compression fractures are low energy fractures which occur primarily in elderly patients with weak, osteoporotic bone and affect as many as 700,000 annually in the us and as many as 25% of women in their lifetime. 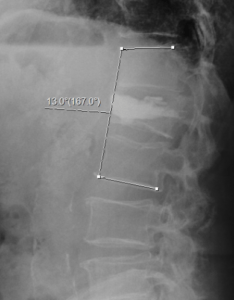 These fracture primarily involve the thoraco-lumbar spine and may occur despite little if any trauma. Patients describe mild to moderate pain in the mid or lower back and most heal with non-operative treatment. A small number develop chronic pain or progressive collapse and kyphosis which can be treated with kyphoplasty. OCFxs occur in bone that has become pathologically weak and fracture under normal physiologic loads. They are seen primarily in postmenopausal women in their 60’s and 70’s and men in their 70’s and 80’s. Less commonly its seen in patients who develop secondary osteoporosis, especially patients treated with corticosteroids. These patients often have more severe osteoporosis and can develop multiple fractures with more severe deformity. Normal cancellous boneon the left compared to osteoporotic bone with thin trabeculae (Osteoprosis Guide National Osteoporosis Foundation 2010). Pain in the mid to lower back is the most common complaint. The pain is usually mild to moderate although some patients may be asymptomatic. The pain often responds to a short period of rest and gradual mobilization. More severe pain may require treatment with narcotic medications and even hospitalization if the patient is unable to mobilize and perform ADLs. Some patients also c/o postural changes with increased forward stooping do to kyphosis (hunchback). Diagnosis is based on a detailed history and physical examination by an experienced spine surgeon. Patients typically have tenderness to palpation and percussion along the spinous process of the fractured vertebra. Fracture can usually be confirmed by xray. MRI maybe necessary to confirm diagnosis, qualify whether its acute vs chronic, and rule out other diagnosis including pathologic fracture (cancer or infection) and lumbar stenosis. 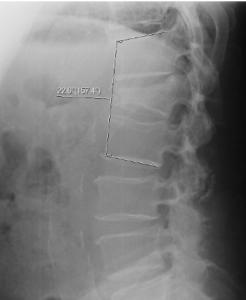 Patient with acute osteoporotic fracture which has collapsed into 23 degrees of kyphosis. Kyphosis greater than 25 degrees is more likely to lead to chronic back pain. Most patients with osteoporotic compression fractures will heal with non operative treatment within 4-6 weeks. This may include a short period of bedrest, pain medications, calcitionin for fracture healing and pain, a LSO brace to improve mobility and gradual return to activities as tolerated. Spinal rehabilitation with PT is helpful to improve mobility and functional abilities. Follow-up evaluation including xray over 10-20 days is important to rule out progressive fractures. Patients with severe pain who are unable to mobilize, progressive kyphosis, and pain that fails to improve despite non-operative treatment maybe candidates for kyphoplasty procedure. This procedure is performed under sedation or local anesthesia on an outpatient basis. The procedure involves insertion of cannula into the fracture site, elevation of the fracture with inflatable ballons, and insertion of cement. This stabilizes the fracture, prevents further collapse, and usually gives immediate pain relief. Patient with kyphosis greater than 25 degrees are more likely to have chronic back pain due to the resulting sagittal imbalance. All patients with osteoporotic vertebral compression fractures should undergoe a workup to rule out secondary cause for the osteoporosis and be evaluated for medical treatment to reduce the risk for future fractures.